It has been a while since I've done an Essential Series post, and I finally had some time over the weekend to put this one together. In my opinion, a white tuxedo jacket is an absolute must have - it stands out so much from the sea of navy and blacks that most people wear. Given the collections from the Italian mob in February they're set to be a big hit for AW12. I've been steadily collecting up images on my dedicated pinterest page to help me see how to wear them in different ways, and was delighted when I received some lookbooks recently with tuxedo jackets as prime pieces. 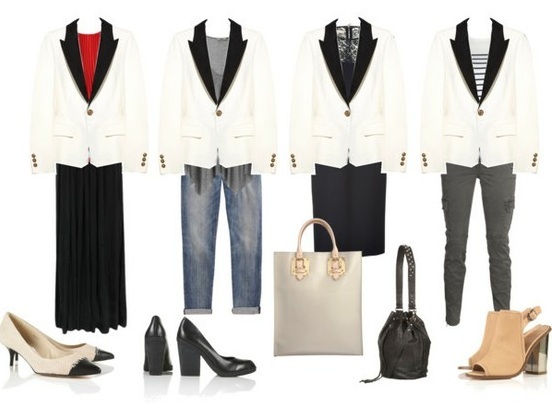 Below are some of my favourite street style spots (including the jacket/individual that sparked the whole thought in my mind - Katie Holmes in the AW11 white tuxedo by Stella McCartney) and above are the top 4 ways I'd work the look. Needless to say, anything Emanuelle Alt (or any of the French Vogue team) wear is going to be on my 'things I have to own before I am 30 or I may jump in front of the tube' list. So when she wore the white tuxedo, I decided I'd happily part the sea in order to own one. I love how she's paired it with a grey tee and a pair of black skinny jeans and looks the nuts. One of my favourite bloggers (below right) Krystal from This Time Tomorrow did the same thing with her tuxedo and a little black dress. I hate to break it to you, but you can't get a brilliant tuxedo that cheaply - unless you are a very savvy shopper. I've tried, and popped the few available on the high street below, along with some more expensive (but worthy) finds. Look out for sales at The OutNet or LUXFIX - blazers often feature and I've spied a good few on each site recently. Malene Birger - I told you The OutNet were good. This gorgeous up-collar tuxedo is £167.50 - half price. Topshop - Fab all-white option here for £65. Very impressed - a friend has it and it looks fab on. BCBG Max Azria - A little hidden gem, I love this jacket - available to the UK through Bloomingdales. Stella McCartney - for something a little less formal, this silk tuxedo blazer is an absolute bargain again from The OutNet with 65% off at £260. Do it. Mango - they have two strong options, one camel and black tuxedo jacket for £69, and one all white option for £39. Yes, thirty nine pounds. Run. Rag and Bone - via Selfridges, of course. Love this simple cut tuxedo - pricey at £435 but no doubt worth every penny. Maison Martin Margiela - Talk. About. A. Bargain. If you are slightly intimidated by the black and white combination then you have NO excuse. This gorgeous white tuxedo is £350, reduced from £1000 at The OutNet. Lastly, I couldn't talk about the tuxedo trend without mentioning this amazing shirt I found on Net A Porter at the moment by Haute Hippie, if you have a spare £255 please buy this. All photo credits and images can be found here on my pinterest board - and all shoes on the board are from Topshop. Love tuxedo blazer is great! !